The supreme leader of non-hasidic Ashkenazi haredi worldwide, 100-year-old Rabbi Aharon Leib Steinman, banned red tablecloths today because they are "for goyyim." Mothers - if your son refuses to stop using "evil devices" [computers, smartphones, etc. ], you should ask the rabbi if it might be a good idea to kill him, or at least cut off a few fingers, or poke out an eye. Hasidim who are too sick or too frail to safely fast are increasingly getting hooked up to IV drips on Yom Kippur in order to keep the 'fast' – even though doing so is arguably a violation of halakha, Jewish law. A haredi woman gave birth while home alone on Shabbat morning as her husband prayed in a Jerusalem synagogue. But instead of going to a hospital she hid the baby under her dress, umbilical cord still intact, and hid the placenta in a bag placed next to her. She refused to speak or communicate – even to call an ambulance – because she had taken a vow to designate the day a ta’anit dibur, a “fast day” for speaking. Two Neturei Karta rabbis attended the recent Soviet propaganda style conference International Alliance For Global Cooperation against terrorism in Teheran. Not surprisingly, this Iranian propaganda event labeled the US and Israel as the world's leading terrorists, not Hamas and Hezbollah, which are funded by Iran and which actually carry out acts of terrorism. Here's video. Rosh yeshiva smashes an 'evil' computer as students gleefully watch and then participate. A Modern Day Book Burning In Israel? Forced to sleep on a dirty mattress, drink only water and eat stale bread. "It's going to be an unbelievable sight to see," said Rabbi Shlomo Ezagui of Chabad of Palm Beach. "Head to toe salami, baby!" Mr. Sulzberger, have ArtScroll's editors taken over your newspaper? "It has been our honor and privilege to meet with President Ahmadinejad ... we have found the Iranian President to be a deeply religious man, dedicated to a peaceful world, based on mutual respect, fairness and dialogue. "Out of great respect to the Iranian Nation and their leadership we proudly welcome the Honorable President Ahmadinejad to New York, WELCOME!" Ynet is reporting Rabbi Haim Druckman was removed as head of the Conversion Authority by PM Olmert. Olmert– scandal-ridden and desperately clinging to power – needs haredi votes to keep him in the Prime Minister's office. Olmert apparently gave into haredi pressure and removed Rabbi Druckman. A Mother in Israel has posted more of her translation of the Ma'ariv article about Rabbanit Keren, the woman who has inspired over 100 haredi women to weak burkas. Rabbanit Keren, it turns out, is a Litvak. But many of her followers appear to be Breslover BTs. Ma'ariv has an interview with Rabbanit Keren, the woman who has 'inspired' dozens of haredi women to wear veils and burkas. What does this self-styled holy woman believe? How does she live her life? Miraim Shaviv, who for a time blogged on the iconic Protocols blog, and then at Bloghead, has been for quite some time the comments editor at the Diaspora's iconic Jewish newspaper, the venerable London Jewish Chronicle. The Forward picked a up a story from its own blog, which in turn picked it up from Jameel at the Muqata, who himself got it from Ha'aretz. Who is that veiled woman shown above? 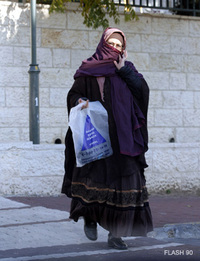 A haredi woman in Israel. That's right. She's wearing a burqa. And so are about 30 other haredi women in Beit Shemesh, Tzfat, Jerusalem and other Israeli cities, and their clique is growing. Why are they wearing burqas? A Bnei Brak infant sustained second-degree burns Tuesday afternoon, apparently while he was being bathed by his parents – who subsequently refused to allow a Magen David Adom emergency medical team to treat the 14-month old. MDA paramedics who were called to the scene were surrounded by residents of the religious town, who tried to prevent them from entering the apartment. Once the paramedics were inside the apartment, the parents refused to allow the infant to be treated, and even refused to accept painkillers for the child. The MDA team was forced to call the police, and with the assistance of the officers removed the infant from the apartment. The child's mother was eventually convinced to accompany her son to Sheba Medical Center in Tel Hashomer. What in the world is going on here? Are haredim now Christian Scientists? Readers? An indespensible [sic] aid for every Kosher kitchen! One of the biggest challenges in a kosher kitchen is preparing bug-free leafy green lettuce and fresh herbs to serve as part of your healthy, delicious meals. Now, with the Bug Checker Portable Light Board™, you can save time, money, eat healthier and enjoy a greater variety of healthier foods. The professional mashgichim at OU currently use large, bulky expensive photographic light boxes to help check for infestations. 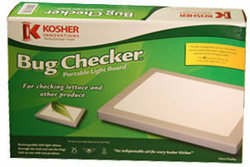 Our new Kosher Innovations Bug Checker™ provides all the benefits of a professional light box, but was designed specifically for the private kosher kitchen. Why not order a second one for Pesach while you're at it? You'll be able to check mounds of maror quickly. It makes a great gift! Every Kallah will love it. The Torah does not mandate light boards or magnifying glasses. At he time the Torah was given, there was no such thing as a light board. In fact, there were no eyeglasses, either. The halakha is based on average eyes, meaning a range of vision from moderately nearsighted to moderately far sighted. There is no requirement in halakha for a better-sighted person to check for bugs rather than a person with worse vision, within that range. Eye glasses have largely put all but a few of us in that normal range. Additionally, the Torah envisions intentional eating of bugs. Further it envisions eating a significant amount of bug. Rabbis first reduced that amount of bug by half, making the halakha much more strict. In other words, the whole haredi panic over checking for bugs with light boxes, special soaks, magnifiers, etc. or refraining from vegetables and some fruits altogether is taking a rabbinic enactment on another rabbinic enactment to a bizarre extreme. They built a fence around a fence, and now haredim are adding a two foot thick, 12 foot high reinforced concrete wall with barbed wire and broken glass on top. Don't waste your money on a light board. Give your $39.99 to a non-haredi tzedaka instead. Briefly, the non-hasidic haredim led by Rabbi Yosef Shalom Elyashiv have banned concerts and other outdoor public gatherings meant to be enjoyable (as opposed to long "Torah" gatherings meant to bore participants forced to endure long speeches by often elderly rabbis). The haredim expended the ban this year to the yearly outdoor Sukkot water-drawing festivities held across Israel. Why? Because of "lewdness" – if the events are held outdoors, men and women may find ways to mix and, well, you know where that could lead. The ban is so strong that the city of Bnei Brak canceled its water-drawing celebration. A spokesman for Tzeirei Chabad, the Chabad youth organization, told Haaretz "We are not opposing the rabbis and are not holding any shows. We have brought to the attention of the Torah sages that for us this is not just a street event, but one that has gone on for years and has value. There is value in holding the events in public. It is not just for the ultra-Orthodox public, but for the wider public, and men and women will remain separate." Ha'aretz also reports that Neturei Karta, of all people, are planning to hold a demonstration of protest against Chabad's decision at the Jerusalem water-drawing celebration. Chabad's celebration will probably get out of hand. Every haredi looking for a good time and willing to violate the ban will be there. So will secular Israelis, Western university students studying in Israel and yeshiva/seminary students on one year Israel programs. What would have been a normal if somewhat loose event may turn into a giant clash between Chabad leaders trying desperately to keep a lid on things and revelers looking for a good time. And, this being Chabad, the Vodka will be flowing. I suspect in the end haredi leaders will have much to criticize and much about which to say I told you so. That haredi over reaction contributed strongly to this situation is a fact haredi leaders will never admit or understand. 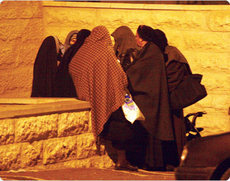 The haredi move to force non-haredim to use Arab-produced or imported vegetables for the shmita year – the year of release where the land is to lie fallow and unworked that begins Wednesday evening – rather than use Israeli produce grown using the pro forma sale of land to non-Jews, heter mechira, has reached a new level of silliness. Israel's Supreme Court is about to rule on the haredi-controlled Chief Rabbinate's move to allow local city rabbis, who are on the government payroll no less, to ban heter mechira produce from their cities and to refuse to grant kosher supervision to vendors selling heter mechira produce – even if they also sell so-called "mehadrin" produce imported from abroad or purchased from Arabs. This will force all vendors to use only "mehadrin" produce and will wreak havoc in Israel's economy. "It's not religious coercion," said Shabatai Markovitz, a manager of Kashrut Le'mehadrin - a kosher supervision outfit under the rabbinic guidance of Rabbi Yosef Yekutiel Efrati, who is himself a disciple of Rabbi Yosef Shalom Elyashiv, the most respected rabbinic authority for Lithuanian haredi Jewry. "We just want the land of Israel to rest in the shmita year, because that is what God wants," Markovitz said Sunday. "If some hotshot economist were to come along and tell secular Israelis that abiding by the rules of shmita would make the economy flourish, they would listen. So why is it that when God says so, they don't?" Rabbi Markovitz knows very well that we possess hametz every year and do so by a pro forma sale of the leaven to non-Jews. He also knows that we collect debts during and after the sabbatical year even though the debts are biblically waived and are biblically forbidden to collect. Yet we do so using a pruzbul, a pro forma transference of one's debts to the local beit din (religious court) which, as an entity rather than a person, is allowed to hold and collect debt during and after the sabbatical year. Who instituted this? Hillel the Elder, no less. Yet haredim – who contribute little to Israel's economy and who are a tremendous drain on its welfare and other resources, and who do not serve in the army – want to force Israel to comply with the strictest interpretation of shmita law. Israeli farmers estimate their loss will be NIS 700 million if this haredi madness is not stopped. That works out to about $170 million US dollars. If adjusted for population size, this would be the equivalent of the US economy losing $8.5 trillion dollars. Haredim ask us to rely on a miracle. I think it's time we asked haredim to rely on themselves. Let Them Have More Babies?! That's right. If haredim can get married and have two children by age 24, they're home free. While this may put more haredim in the workforce, which is the aim of this proposal, more than likely it will mean more haredi babies. Why? Because Lithuanian haredim now marry relatively later than Yerushalmi and hasidic haredim, who marry at 17 or 18. But, with this new law in effect, the incentive will be for Lithuanian haredim to marry three of four years earlier. Their birthrate will increase as a result, increasing the over all number of haredim and making the demographics released last week even worse. This horrendous proposal will also gut the already paltry number of haredim who do serve in the IDF. Israel's National Religious, Modern Orthodox and Secular population will continue to pay with blood while haredim get off free.